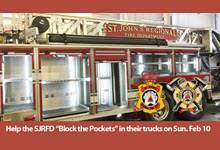 The SJRFD and the St. John’s Firefighters Association Local 1075 are asking the community to “Block the Pockets” in our fire trucks on Sunday, February 10 in support of the Community Food Sharing Association. We know firsthand, as firefighters, the impact and devastation that a fire can cause to individuals and the community at large. As proud Newfoundlanders, Labradorians and firefighters, we always reach out to help our neighbors in time of need and so the time is here!! Help us “Block the Pockets” full of food for our community. Drop by one of our fire stations anytime between 10 a.m. – 4 p.m. on Sunday, February 10, meet our firefighters, tour the stations and place a non-perishable food item in one of our fire truck pockets! Fire Chief Colford, Craig Smith, President St. John’s Fire Fighters Association Local 1075 and members of the SJRFD will be on hand at 2:30 pm Monday, February 11, to make the presentation of goods collected to Mr. Eg Walters of the Community Food Sharing Association. The presentation will take place at their new home on Pippy Place. All are welcome to join us for this presentation and lend a hand getting the goods placed in their warehouse.